One of the best things about working in the bridal industry is seeing a bride’s face light up when she sees herself in THE dress for the first time. There is really nothing like trying on a wedding dress that gives one an abundance of confidence. And why shouldn’t we have that much confidence every day?! Your wedding dress can say a lot about your individual style. From the silhouette to the train, there are so many ways to reflect that. However, no dress is complete without accessories! We are so fortunate to be able to collaborate with Nicki O’Connell as our custom accessories designer in Mary Elizabeth’s. Nicki is the founder and owner of Adele Amelia’s Bridal Accessories, a business in which she designs and creates custom, hand-made bridal accessories. Being in the design industry since the 1980’s has given her experience in creating all kinds of accessories for all kinds of brides from all over the world. Whether you want a sparkly belt or an elaborate garter for your special day, Nicki can create something for you in any size, length, or color! She can also customize your shoes from lacy ballet flats to sparkly converse. And of course we cannot forget the beautiful hand-made veils (which Emily and Jessica like to call the “lipstick” of the whole wedding look). She can help you match a veil and other accessories to help further create your own perfect wedding day look! Stop by to come see Nicki and the rest of us at Mary Elizabeth’s by making an appointment today! This season of life for brides-to-be is filled with joy, excitement and a whole lot of stress usually. Unfortunately, stress is usually part of planning a wedding. In the words of my preacher though (who I need to credit the title of this blog to) “Count It All Joy.” Life is full of ups and downs and bumps along the way but we serve a God who is there to guide us through them, all you need to do is trust Him. So when you are about to lose your sanity because the weather channel is calling for rain on your special day, someone in your family disagrees with some part of the wedding details, or every everything isn’t going as planned…. Count It All Joy! This is an exciting time in your life, don’t run yourself ragged and forget to soak it ALL in! You are entering into a new season of life and love that will hopefully sustain you for the rest of your life. Don’t let the idea of marriage and all God intended it to be get mixed up in all the details of planning a wedding. Count every step of the journey as joy. At the end of your special day all you will have is your wedding dress, pictures from the day and your husband. Enjoy, celebrate, rejoice and count it all joy! We are halfway into 2018, and we have been keeping an eye out for new and exciting trends for our beautiful brides. From Bridal Fashion Week Fall 2018 to the exquisite royal wedding, there have been many gown inspiration for brides of all styles. We handpicked five of our favorites from what have seen so far this year! Colors- Colored gowns are an emerging trend that gives the unique bride a sense of individuality and creative freedom. It is daring but also very elegant. Bridal Fashion Week debuted a various colors like blush pink, powder blue, gold, and silver. The Royal Influence- There has been a lot of buzz around the simplicity and elegance of Meghan Markle’s wedding dress. Bridal Fashion Week designers also showcased “naked” dresses as a way to veer the eye away from the ever-popular sparkle and lace. Other lines have also been inspired by vintage royal weddings giving gowns a more dramatic look. Dramatic Veils- Tying into the the royal inspiration, dramatic veils are always an elegant and regal touch to your wedding day look. Adding a long cathedral or royal length veil adds an ethereal and dreamy feel to any gown. Dramatic veils are also a perfect way to frame the train of the gown. Capes- One of the biggest talks of Bridal Fashion Week Fall 2018 was the cape. Adding a cape is another way to romanticize a gown and give it a dramatic look. This could be a great alternative for a bride that may not want a long veil. Short caplets are another modification to this trend. So Many Sleeves- Sleeves have always been a beautiful look, especially for a cold fall/winter wedding. 2018 has introduced new and old styles to give any dress a unique twist. Some of these styles include cold-shoulder sleeves, modest sleeves, and detached sleeves as well as the return of the 80’s/90’s puff sleeve. How do you feel about these trends? What other bridal trends have been your favorite for 2018?! I have come to find that one of the best things about meeting new people is seeing that everyone has a different style that helps define who they are. With Savannah being such a diverse city, it is exciting to see how people choose to embrace who they are through what they wear, especially in the bridal industry. Bridal gowns are such a fun way to display a bride’s individuality for one of the most special days of her life! There is such variety in the bridal gowns. From vintage to modern, from lace to sparkles. A bride could want a thousand ruffles or sleek lines (and not to mention the vast amount of silhouettes and necklines to choose from). All of these things come together to make a beautiful gown for a beautiful bride, and we have had the pleasure to meet so many of them! One of my personal goals in life is to not only be confident in my own style, but also encourage others to have confidence and to be the amazing person God intended for them to be. A lot of the time we can let our insecurities or fear of opinions cloud our views of how truly great we are. Hopefully this can be an encouraging reminder that whether it is what you wear on your wedding day or even a regular Tuesday, do not be afraid to embrace that individuality! We have all heard that one before.. Mary Elizabeth’s Bridal is here today because two women took a chance! Here I am Sarah Ann, the new intern typing this blog post because I took a chance in reaching out and asking for an internship with this flourishing business. Taking a chance doesn’t stop with me though another young woman had the same idea I had and reached out about an internship with Mary Elizabeth’s. Now here we both are working for one of our favorite stores here in Savannah. We have all gotten to the point we are at in life because we took a chance at some point. While not everything always turns out the way we would hope you will never know until you take a chance. So whether it’s on saying yes to a new opportunity life has thrown in front of you, going for your dream job, or just taking a chance on something that makes you happy- TAKE IT! Minimize the “Should haves” and go for it! We hardly ever regret the chances we take but instead the chances we didn’t. Today is for taking a chances! We are so excited to be launching our first Morilee trunk show!! This morning, we unboxed over 30 (yes 30) sample gowns, and it felt like Christmas! It’s also very exciting for our brides to share this exclusive experience with us, but we want to make sure everyone knows what a trunk show is. That’s where I come in! So, a trunk show is typically a time when a designer will showcase their collection exceeding what a boutique will regularly have in their inventory. In this special case, we have Morilee’s Spring 2018 collection samples available for two whole weeks! Not only do you get a lot of options with different silhouettes but also 10% off if you purchase a dress from the trunk show collection. This a perfect time to explore your options and see the dresses that you’ve been pinterest-ing for some time now. It’s also your chance to potentially find THE dress for your perfect day! We would love to for you to join us, so make an appointment online or by phone. You can also keep up with us by following our Instagram @maryelizabethsbridal. We can’t wait to meet you! One of the biggest perks of being in Savannah is the pure beauty. This town is gorgeous, from sun-up to sundown! We took a walk downtown with one of our most popular gowns, 5504 by Morilee! This gown is breathtaking in person, and as you can see, photographs like magic. And the lovely accessories? Done by Adele Amelia, our in-house accessory designer! We chose a cathedral length horsehair veil for some added drama, and the rosegold Kathleen sash. Rose gold is the perfect accessory color! We chose matching rose gold earrings, that worked so well with our models stunning red hair. And the extra surprise! A crown, for an extra touch of whimsy. Love this gown & accessory combo? Set up an appointment to come shop with us! This Thanksgiving there were so many things to be thankful for. A wonderful new city to call home, amazing and supportive friends and family, sweet new friends, phenomenal wedding vendors to work with, and a successful business are just a few things to thank God for this holiday season. Never in a million years did we think we would be calling Savannah home, much less owning our own business. The Lord has been more than gracious to us these past few months and we pray his continued blessings over our business. We hope you all had a day filled with love and laughter spent with family and friends! When a bride comes in searching for the perfect wedding dress, one of the first things we tell her is to keep an open mind. It is absolutely necessary to come in with an idea of what you want your wedding and bridal gown to look like. Pinterest pins, screenshots from Instagram, clips from magazines, and other images are SO VERY helpful. They give your stylist an idea of what you are looking for and what you do and do not like. However, it is also important that you are willing to step out of your comfort zone and try on a couple dresses you would not normally pick for yourself. While working with a bride, we always listen to not only the words they are saying but also what their face is saying. You can tell almost immediately what a bride is thinking by looking at the emotion on her face. Sometimes the mermaid dress they could not wait to try on suddenly does not look like they thought it would. Or the ballgown they pinned over and over again simply does not give them the feels. I always like to pick a couple dresses the bride would not normally pick for herself (within reason of course). It's been so much fun to see the bride's face light up when they realize that maybe they do like lace or maybe what they were looking for was a little sparkle in their life. Cheers to open minds and full hearts! Ahhhh... the veil moment. Bring out the tissues! This is when the tears are shed. The bride-to-be begins to really see herself as a bride and that moment is magical. Friends and family (particularly mothers) make this moment extra special as they bask in the beauty radiated by the bride. It is absolutely my favorite part of the wedding dress shopping experience! At Mary Elizabeth's Bridal, we have a new custom accessory designer, Adele Amelia! Y'all- she has created some of the most beautiful bridal accessories! Her custom veils and birdcages, hair pieces, sashes, garters, jewelry, and wraps are now found exclusively at Mary Elizabeth's! We are SO incredibly excited!!! I don't know about you guys but SPARKLE is my favorite color! And she has some amazing sparkle in her collection! She also has some beautiful tulle pieces and some lace items that are to die for! Go follow her on social media @adeleameliabridal and check out her website www.adeleamelia.com! The best part of this is not only do we have her fabulous accessories in our store, but we have the designer too! She is able to consult with brides while they are trying on their gown! I have posted a few of her items below. We will post more on our website and social media very soon! You never know who is going to walk in your place of business. Kindness and a general sense of caring goes an extremely long way with most people. I don't know about you, but I like to sprinkle a little kindness around everywhere. It makes others feel better, and in turn makes me have a better attitude. A week ago we had an amazing bride-to-be walk in our door. She, her two sisters, and her mother began their wedding dress shopping frenzy in Mary Elizabeth's early Saturday morning. Just like any other appointment, we popped a bottle of champagne, began pulling dresses off the racks to go to the dressing room, and started getting to know these girls. You see, it's about more than just selling a dress. It is about getting to know people, letting them know that you genuinely care about them and their big day, and fostering an environment that is exciting and non-stressful! So much about planning a wedding can be stressful. The wedding dress shopping experience should be SO MUCH FUN! Laughter should be plentiful and tears of joy happen often. 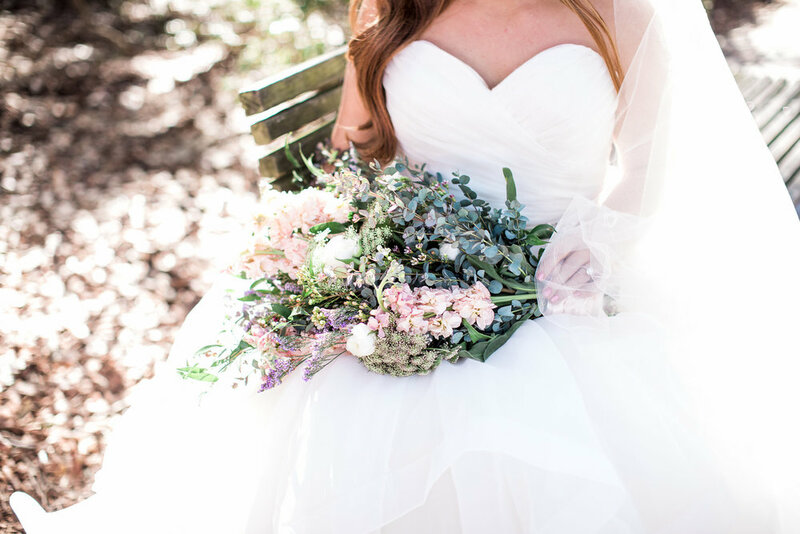 This particular sweet bride found a dress that is STUNNING on her! Jaws will drop when she walks down the aisle!! She wanted to continue to shop to get the whole experience and we totally understood so we took pictures just in case, wrote down measurements, gave out hugs, and they made their way to a local spot for lunch before their next appointment. Kindness is FREE y'all! We should be sprinkling that stuff around everywhere! Our grand opening was a success! We had bubbly, food, good stories, and great company! Mr. Gary from Smith Brother's Butcher Shop made a cheese tray that was sent straight from heaven. Members of the Chamber came by and we cut the ribbon to celebrate our opening. Sweet Mary Elizabeth made her debut at Mary Elizabeth's and she captured the crowd with her adorable dimples and contagious laugh! A huge thank you goes to Melanie with MLM Photography and Nikki O'Connell for helping us capture moments throughout the evening!! Networking and meeting new people has been a priority for us the last few weeks. Meeting other wedding vendors in the area has been so helpful! They have given us a ton of support, encouragement, and wise words of advice. We joined a creatives group called Tuesdays Together and these ladies (gents too) are AWESOME! Wendy with Apt B Photography, Cindy with All About You Entertainment, and Stefani with Stefani Ashley Photography introduced us to a great local place called Back in the Day Bakery this past Wednesday morning. Oh my stars- their homemade biscuits are TO DIE FOR!!! If you are ever around Bull Street and like carbs, you MUST stop at this charming spot! Downtown Savannah has proved to be an amazing location filled with wonderful people and phenomenal food! As for the bridal boutique, our calendar is filling up, appointments slots are being filled, and we are LOVING every minute of the bridal world! October is looking to be a busy month and we could not be more excited! Well, we made it! Our first month open as a bridal boutique in downtown Savannah was a success! We sold some dresses, made so many connections, and survived a HURRICANE y'all! Our first bride was such a joy to help! Of course it had to be a special situation. All firsts are, right? Our sweet girl got married this past weekend in her stunning gown and we could not be more excited to have been able to assist her! After our first bride came a few more and we LOVED helping them all! Amidst the joy, we also felt the first heartbreak of rejection as others came in to look at our dresses but bought elsewhere. But that happens. It's all part of the business. We REFUSED to be discouraged, pulled ourselves up by our boot straps, and continued to look for the next bride we can help! Every time we see that appointment notification pop up our little hearts skip a beat with excitement! We have made so many new friends!!! Mr. Gary from the Smith Brother's butcher shop a few doors down has been a ray of sunshine during our new journey! He comes to check in on us regularly and puts a smile on our face every day. Heather- one of our fellow bridal store owners reached out to us to welcome us to the neighborhood. THIS IS WHAT IT'S ABOUT PEOPLE! So- thank you Heather for showing kindness towards the new kids in town! You certainly made a great impression on the two of us and your kindness will never be forgotten. We've made connections with marketing professionals, other wedding vendors, a very sweet lady for all of our alterations, and so many more. The people of Savannah have been so welcoming and it has truly warmed our hearts! We went to our first bridal show in Atlanta (VOW) and cannot wait to show you all some of the great things we found!! We even survived a hurricane during that process. Yes guys. A dang hurricane our first month in business. Irma- you did not get the best of us! In fact, you made our story that much more entertaining. We tucked all of our ladies in their garment bags and put them in a safe location. And we prayed. A LOT of prayers. We are heartbroken to know there are some that were not as fortunate. Our thoughts and prayers are still with those that Irma impacted. As we sit here and reflect on our first month in preparation for our grand opening this week, we are continually reminded of our blessings. We are so thankful. Thankful for our brides, thankful for our new friends and the people of Savannah, thankful for friendly competitors showing kindness, thankful that Irma showed us some mercy, thankful for supportive friends and family. We cannot wait to celebrate with everyone Friday! Love to you all! Even though you're fed up, you gotta keep your head up. From the moment we started contemplating this move to Savannah, we prayed that the Lord would guide our steps, and if things started falling into place we would go. If you would have told me how perfectly the Lord would lay out the next 2 months, I wouldn't have believed you. We quickly started seeking business advice from our attorney, accountant and business mentor, all to realize they were all saying the same thing....You NEED to do this. From this point on we knew the Lord was starting to pave our path in the right direction. The first day we came to Savannah back in June to search for a property, we knew we needed to get creative. I had picked a few different places off Realtor.com and thought, what the heck let's go look at all of them. As soon as we stepped into 541 East Liberty we saw the potential, but knew we had our work cut out for us. As the day went on, we looked at multiple properties and knew that none of them had the historic Savannah charm that we were looking for except 541. After returning back to Valdosta we started the leasing paperwork process with our realtor. By the end of June we had secured our business location, but quickly found that we could not get in to 541 until July 28th. No worries, panic mode had not set in just yet! (HA!) The immediate retail therapy kicked in; we needed mirrors, furniture, cabinetry etc. to make this store look great! I will never forget the games of tetris we played trying to fit every possible thing we bought into our SUVs! Fast forward to July, and we both made our big move to Savannah to start settling in before store renovations would start. Remember how I said panic hadn't set in just yet? Scratch that, we were now feeling the pressure of "Oh Lord we don't get in this building until July 28th and we open for business on August 12!" FIFTEEN DAYS to pull this off. FIFTEEN Y'ALL. In those 15 days, we had so many friends and family members support us and help us get things done. From painting the walls, Jessica's dad building all our shelving and installing it, floors (dear God the floors...), and my parents packing down the Uhaul of furniture for the store. There are not enough words to express our thankfulness to every person who has helped in this endeavor. Countless trips were made to Lowes, Home Depot, and Home Goods. Things didn't work, pieces didn't fit, and many times we didn't have enough of one thing but had too much of another. We left the store one day during the renovation process and noticed a sign on a barbecue shack a few blocks down from our store. It reads "Even though you're fed up, you gotta keep your head up" -Tupac. Who would've thought we would get our inspiration from Tupac?? That quickly became our motto and the 15 days passed before we could blink. So here we are, celebrating our first weekend open and our first customers. We are humbled. We are thankful. We are blessed. It is our prayer that we are now able to bless others. Before and after pictures will be posted soon. Here we are day five into renovation and this still feels like a dream. As Jessica and I stared around the blank walls of our store just a few days ago, I thought to myself "How in the world will this ever get done?" Well friends, the Lord is faithful and we are progressing right on schedule. Does this mean there haven't been setbacks? No. Does this mean we haven't been stressed to the max? I can assure you, no, but there is one thing that has kept us going through this process and that is the love and support of our family and friends. Friends. They fuel you, inspire you, and encourage you to chase your dreams. So, I know you're probably still reading this title and thinking, "what in the world does this have to do with the bridal store?" I can start by telling that 9 years ago my life was forever changed by my 10th grade English teacher and this may help answer the infamous question of how we came up with our name. August of my Sophomore year I stepped into the classroom of Lindsey "Raulerson" Martin. This would be the person who would challenge me, grow me, and learn to love me despite our strong willed personalities. Something I would never be able to appreciate until I got older. Over the years our friendship has grown in many ways as we've walked through the good and bad times, the news of her newborn baby, and so many other life changing moments. On March 30th, 2017 with tears of joy, I stared into the eyes of a beautiful little girl named Mary Elizabeth Martin. From that day I knew this child would always hold a special place in my heart, but I never realized just how much joy she would bring me in the months to come. Life gets hard (can I get an Amen?! ), people change and unexpected things happen but the Lord always gives you what you need to overcome. For me that was Lindsey and Mary Elizabeth. So fast forward to June, Jessica and I we were knee deep in paperwork, trying to make this bridal business work. We started searching for what would be the perfect name and we were drawing blanks. Being in the heart of Savannah, we knew we wanted a name with southern elegance and grace encompassed, but something that also has meaning. I started questioning the thought of a personal name. We had just left Lindsey's house one night and I threw out "Mary Elizabeth's" in the car praying that Jess didn't look at me like I was crazy. Thankfully she was thinking the same thing! She and Lindsey have been great friends for many years. There was no better way to honor Lindsey, the most genuine, humble person we know and always reminding us of our southern etiquette. So here's to writing thank you notes, southern hospitality, and the truest form of friendship. Cheers to Mary Elizabeth's! As I sit here in my new apartment sipping a good cup of coffee, I'm still in awe at how all of this has transpired over the last two months. So many have felt out of the loop and confused. Believe me, there have been times during this process that I have been confused as well. You see- there's a story to tell and I will start at the beginning. Grab yourself a cup of coffee too. This is a long one. I put my house on the market two years ago and prayed that it would sell at just the right time. Well, January 2017 was apparently the right time and I got a contract on it. I knew I wanted to spread my wings outside of Valdosta but I didn't know exactly where I wanted to land. I started looking at some options. Some friends lived in Tennessee just north of Nashville. On a whim I decided to check their school system website for vacancies. Teaching high school was my passion and all I had known for seven years. There were several openings and to make a long story short, I applied and got several job offers immediately. So, it looks like I am moving to Tennessee at this point. I turned in my resignation at Lowndes High School (the only job I have known) and began to prepare for my transition over the summer. After school ended in May, I made a trip to Tennessee to find an apartment and to get the keys for my new classroom. I took a dear friend of mine, Emily, with me. A few weeks prior I started having some second thoughts but kept them all to myself. Was this the right move? Did I just jump at the first opportunity to get out of Valdosta? Will I really be happy in Tennessee? Needless to say, I felt lost. And let me tell you friends, that is not a good feeling. I didn't know what I wanted to do or where I wanted to be. Heck, I didn't know if I even wanted to teach anymore. While in Tennessee, Emily and I looked for some new furniture. She had no idea of my lost feelings but I do know that she did NOT like the idea of me moving 8 hours away. This is where the Rooms to Go parking lot comes in. I found some furniture I liked but I couldn't make myself buy any of it. The day before I found an apartment that I liked but couldn't make myself apply for the lease. Something just didn't feel right. I didn't have peace. And in that Rooms to Go parking lot, I finally let all of my thoughts out. Emily made some ugly crying faces and told me not to move. That's what good friends are for right? To ugly cry with. I remember asking her, "if I don't move here and teach, what am I going to do?" Her response- "let's move to Savannah and open a bridal store." Someone should have been there to take a picture of my face. Emily had no idea that while I was in college, my dream was to open a bridal store. I remember having conversations with my mom and a few close friends about it like it was just yesterday. The timing was never right and I eventually let the dream go. Fast forward back to the Rooms to Go parking lot in Tennessee and my conversation with Emily. I knew she was right as soon as she said it. This is what I am supposed to do. I had that deep down in your gut good feeling. But it scared me. Teaching was all I had ever known. It is so difficult to step out of your comfort zone. But I promise you friends- when you do, you will fly and you won't regret one second of it. We began talking about some logistics and my exact words to her were "you better pray that Jesus does some speaking. And I mean LOUD speaking. And when I say loud, I mean I need a flashing marquee sign with a huge arrow pointing me in the direction I am supposed to go." After we returned home, we began to pray. And prayed. And then we prayed some more. Doors started opening. I have told so many people this has to be God. There have been doors opened that were not supposed to open. We immediately found a wonderful location to open Mary Elizabeth's Bridal in historic downtown Savannah. We have had so many friends and family members go out of their way to help us. So here I am sitting in my new apartment in Savannah preparing to open my very own bridal store with one of my best friends. This whole journey has been a blessing and a reminder that God is faithful when we place our trust in Him.